The vagus nerve splits into branches that go to different parts of the stomach. Stimulation from these branches causes the stomach to produce acid. Too much stomach acid leads to ulcers that may eventually bleed and create an emergency situation. Vagotomy is performed when acid production in the stomach can not be reduced by other means. It is used when ulcers in the stomach and duodenum do not respond to medication and changes in diet. It is an appropriate surgery when there are ulcer complications, such as obstruction of digestive flow, bleeding, or perforation. The frequency with which elective vagotomy is performed has decreased in the past 20 years as drugs have become increasingly effective in treating ulcers. However, the number of vagotomies performed in emergency situations has remained about the same. Vagotomy is often performed in conjunction with other gastrointestinal surgery, such as partial removal of the stomach (antrectomy or subtotal gastrectomy). There are several types of vagotomies. Truncal vagotomy severs the trunk of the vagus nerve as it enters the abdomen. 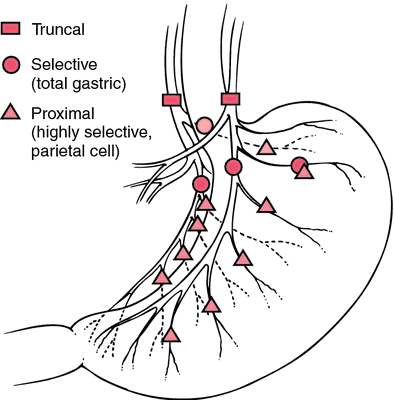 Parietal cell or proximal gastric vagotomy leaves the trunk intact, but severs the branches that go to different parts of the stomach. Patients who receive vagotomies are most often seen in emergency situations where bleeding and perforated ulcers make it necessary to act immediately. As with any major surgery, people who use alcohol excessively, smoke, are obese, and are very young or very old are at higher risks for complications. Vagotomy is performed under general anesthesia by a surgeon in a hospital. The surgeon makes an incision in the abdomen and locates the vagus nerve. Either the trunk or the branches leading to the stomach are cut. Then the abdominal muscles are sewn back together, and the skin is closed with sutures. Often, other gastrointestinal surgery is performed at the same time as the vagotomy. Part of the stomach may be removed, for instance. Vagotomy causes a decrease in peristalsis and a change in the emptying patterns of the stomach. To ease this, a pyloroplasty is often performed. This procedure widens the outlet from the stomach to the small intestine. A gastroscopy and x rays of the gastrointestinal system are performed as diagnostic procedures to determine the position and condition of the ulcer. Standard preoperative blood and urine tests are done. The patient should discuss with the anesthesiologist any medications or conditions that might affect the administration of anesthesia. Patients who have had a vagotomy stay in the hospital for about seven days. For the first three or four days, nasogastric suctioning is required. A tube is inserted through the nose and into the stomach. The stomach contents are then suctioned out. Patients eat a clear liquid diet until the gastrointestinal tract is functioning again. When patients return to a regular diet, spicy and acidic food should be avoided. It takes about six weeks to fully recover from the surgery. The sutures that close the skin can be removed in seven to ten days. Patients are encouraged to move around soon after the operation to prevent the formation of deep vein blood clots. Pain medication, stool softeners, and antibiotics may be prescribed following the operation. As with all surgery, excessive bleeding and infection are possible complications. In addition, the emptying patterns of the stomach are changed. This can lead to dumping syndrome and diarrhea. Dumping syndrome is a condition where shortly after eating, the patient experiences palpitations, sweating, nausea, cramps, vomiting, and diarrhea. Normal recovery is expected for most patients. In about 10% of those who have vagotomy without stomach removal, ulcers recur. Two to three percent of patients who have some portion of their stomach removed also have recurrent ulcers. Way, Lawrence W., editor. "Stomach and Duodenum." In Current Surgical Diagnosis and Treatment. 10th ed. Stamford: Appleton & Lange, 1994. Duodenum — The section of the small intestine immediately after the stomach. Peristalsis — The rhythmic contractions that move material through the bowel. interruption of the impulses carried by the vagus nerve or nerves; so called because it was first performed by surgical methods. The surgical procedure is done as part of the treatment of gastric or duodenal ulcer and often is performed in combination with gastroenterostomy or partial gastrectomy. The vagus nerve stimulates gastric secretion and affects gastric motility, so that vagotomy reduces the secretion of gastric juices and decreases physical activity of the stomach. Sites at which the three types of vagotomy are performed. highly selective vagotomy division of only those vagal fibers supplying the acid-secreting glands of the stomach, with preservation of those supplying the antrum as well as of the hepatic and celiac branches. medical vagotomy interruption of impulses carried by the vagus nerve by administration of suitable drugs. parietal cell vagotomy selective severing of the vagus nerve fibers supplying the proximal two thirds (parietal area) of the stomach; done for duodenal ulcer. selective vagotomy division of the vagal fibers to the stomach with preservation of the hepatic and celiac branches. truncal vagotomy surgical division of the two main trunks of the abdominal vagus nerve as they emerge through the esophageal hiatus. Division of the vagus nerve. /va·got·o·my/ (va-got´ah-me) interruption of the impulses carried by the vagus nerve or nerves. highly selective vagotomy division of only those vagal fibers supplying the acid-secreting glands of the stomach, with preservation of those supplying the antrum as well as the hepatic and celiac branches. medical vagotomy that accomplished by administration of suitable drugs. parietal cell vagotomy selective severing of the vagus nerve fibers supplying the proximal two-thirds (parietal area) of the stomach; done for duodenal ulcer. 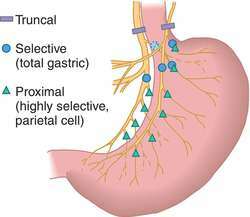 truncal vagotomy surgical division of the two main trunks of the abdominal vagus nerve. Surgical division of fibers of the vagus nerve, used to diminish acid secretion of the stomach and control a duodenal ulcer. the cutting of certain branches of the vagus nerve, performed with gastric surgery, to reduce the amount of gastric acid secreted and lessen the chance of recurrence of a gastric ulcer. With the patient under general anesthesia, a gastrectomy is performed, and the appropriate branches of the vagus nerve are excised. Because peristalsis will be diminished, a pyloroplasty or an anastomosis of the stomach to the jejunum may be done to ensure proper emptying of the stomach. See also anastomosis, gastrectomy, peptic ulcer, pyloroplasty, vagus nerve. An operation to cut some or all of the branches of the VAGUS NERVE to the stomach so as to reduce its effect in promoting acid and PEPSIN secretion. As a result of advances in drug treatment with H2 receptor blockers such as Ranitidine (Zantac) and the discovery of the role of the organism Helicobacter pylori in causing peptic ulceration, this operation has almost been abandoned. interruption of the impulses carried by the vagus nerve or nerves. Truncal vagotomy with short loop posterior gastrojejunostomy was done in 12 patients. In the post-operative period of the patients who underwent truncal vagotomy with posterior gastrojejunostomy, two patients had wound infection. The uncomplicated 40 patients who were belonging to study group underwent truncal vagotomy with retrocolic isoperistaltic gastrojejunostomy. Group B-Another forty patients with chronic uncomplicated duodenal ulcer were treated with total truncal vagotomy with retrocolic isoperistaltic gastrojejunostomy. For duodenal ulcer cases: 18 patients (100%) underwent truncal vagotomy with posterior gastrojejunostomy. In the present series, 100% of cicatrized duodenal ulcer patients underwent truncal vagotomy with posterior gastrojejunostomy as in the study by Hyasinta Jaka et al. Radical treatment of perforated Duodenal Ulcer by antrectomy and truncal vagotomy is justified in the hands of experienced surgeon. CASE REPORT: A 58-year-old male patient underwent an uneventful Total Truncal Vagotomy with Posterior Vertical Retrocolic Isoperistalitic No loop Gastrojejunostomy for peptic ulcer in 1st part of duodenum. 1%) underwent truncal vagotomy with posterior gastrojejunostomy, 1 case underwent truncal vagotomy with antrectomy. Twenty five patients underwent laparoscopic appendicectomy and five patients underwent truncal vagotomy. Maudar et al preferred Truncal Vagotomy & Gastrojejunostomy to simple closure as simple closure of the perforation in the 3 infants they studied resulted in fatalities due to fulminant septicemia (1).